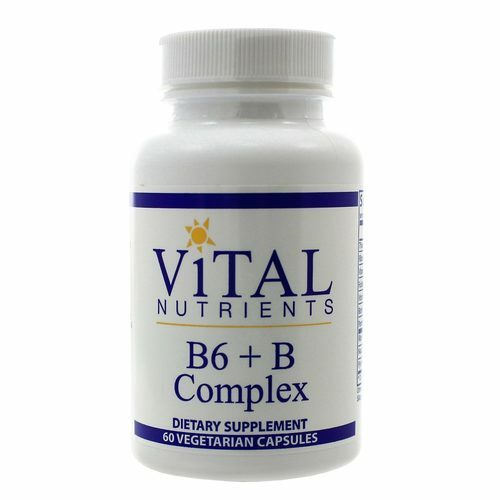 B6 + B-Complex provides a high dose of Vitamin B6 combined with the rest of the B vitamins to make this an excellent choice for female support, and relieving common symptoms associated with the menstrual cycle. Essential for tonifying the nervous system, B-Complex vitamins play a role in the metabolism of protein and fats, and help convert carbohydrates into energy. B6 + B-Complex helps promote the conversion of homocysteine, thus supporting heart health. Warnings: If pregnant, consult your physician before taking. Notes: Store sealed in a cool dry place. Keep out of reach of children. Use only if safety seal is intact. 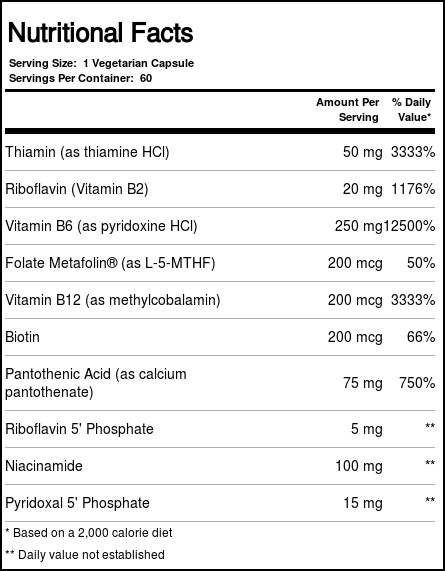 Excludes: coatings, binders, gluten (wheat, rye, barley), milk/dairy (casein, whey), soy protein, egg protein, sugar.